Symbolizing humility and reverence, the white flowers of this elegant spray create a white-on-white blanket of blossoms. Combining textures, sizes and shapes, its graceful style evokes modesty and innocence. 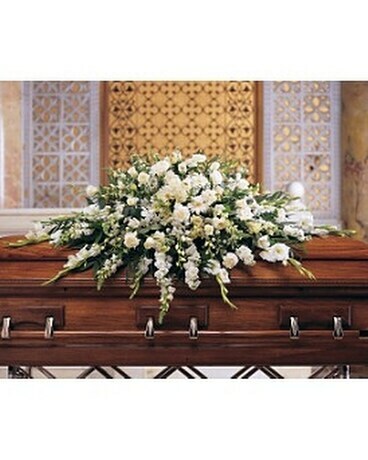 One casket spray is delivered decorated with white carnations, gerberas, gladioli, asters, orchids, roses and stock, along with emerald palm and salal.